Imagine Shorewood as a continuum of history, from Native American hunting ground to the home of Ferris wheels and trolley cars and eventually to a suburb of quiet, tree-lined streets. In 1673, French explorer Pere Jacques Marquette and his voyageurs canoed past this heavily wooded area overlooking Lake Michigan. Sioux and Algonquin Indians hunted here. Explorers and trappers soon joined them. Now, imagine you are driving down crowded Oakland Avenue on a busy Saturday night. As you approach Edgewood Avenue, you glance to the west and see a baseball field, parking lot, apartment buildings and a row of business front. You give little thought to what the southwest quadrant of Shorewood – Edgewood Avenue on the south, Milwaukee River to the west, Oakland Avenue to the east, and Newton Avenue to the north – looked like more than 100 years ago or the major role in the area played in the village’s history and development. At the beginning of the 20th century, water slides, a motordrome, and noisy Saturday night beer halls covered the area. An endless line of trolleys brought park visitors from Milwaukee. A 1920s housing boom – spurred by the construction of an enormous transit hub in this quadrant – encouraged everyone from bank presidents to tradesmen to move to move to the growing suburb. Not unlike today, it was the era of boosters, boasters and beer drinkers that set the village on future course. The rest of Shorewood may have grown quietly – but this part of town was a regular hellzapoppin’. In 1872, Frederick A. Lueddeman had an idea to open his river-side farm to the public, adding benches and paths and bravely named Lueddeman’s-on-the River. The resort attracted visitors traveling by boat from Milwaukee. Within a year, the Northwestern Union Railway laid tracks for its steam engines across the Shorewood plateau. Otto Zwietusch bought 33 acres from Lueddeman in 1873 and named it Mineral Springs Park. He planted more than 400 trees, developed a shady walk overlooking the river and added picnic areas. Bottled water from the springs on the property was sold as Appollo spring water. Zwietusch was on a roll. He boasted of the “most popular park in Milwaukee.” He added a two-story hotel for 50 guests, with a billiards room and restaurant. Boats, horses, wagons, trains and streetcars brought patrons to enjoy a country afternoon, while sipping Appollo water and beer. 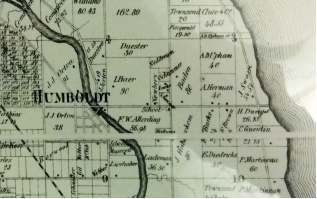 In 1900, the Village of East Milwaukee (precursor to Shorewood) was established. Zwietusch had quit bottling the spring water and began selling the bottling equipment. The park looked run down. A new owner was welcome. Oscar Miller and the Summer Amusement Company purchased Mineral Springs enterprise and renamed it Coney Island Park, “the Coney Island of the Midwest.” (The original Coney Island is located off the northwest coast of Ireland, and the name apparently refers to rabbits). Patrons from all over the county arrived by streetcar, which dropped them off at the Oakland Avenue and Menlo Boulevard gate. The attractions drew thousands of visitors annually. A huge wooden rollercoaster, the Scenic Railway, wound its way through the park. The Oriental Elephant, a massive funhouse shaped like its namesake, boasted a haunted center, if you were brave enough to find it. Theaters offered opera and vaudeville acts, such as acrobats, comedians, jugglers, dancers and singers. There were beer gardens, shooting galleries, a high-wire act overhead and a small zoo. Entrance was free but the park’s biggest rides and shows cost 10 cents for adults, a nickel for children. The typical daily cost for a family of five: $5. In those days, unfortunately, even that amount was prohibitive. Most people visited just once during the brief summer season. The park languished and closed after three seasons. The resort was renamed Wonderland Amusement Park from 1905 to 1909. New owners added water chutes, a 200-foot tower and a larger Ferris wheel. Attendance picked up, but the park remained unprofitable. Finally, the business was reopened as Ravenna Park in 1909. The Milwaukee Motordrome, a steeply banked motorcycle racetrack, was added to park attractions and drew noted cyclists of the day. Despite some financial success, the days of the Shorewood amusement park culture were doomed. Ravenna was now surrounded on three sides by new homes and businesses. Loud music, garish lights, trash and beer-sodden crowds roving up and down Oakland Avenue seemed out of place. Acting on complaints of neighbors, the village refused to approve the park’s annual operating permit in 1916. By 1917, Shorewood had its new name and was seeking a new image. 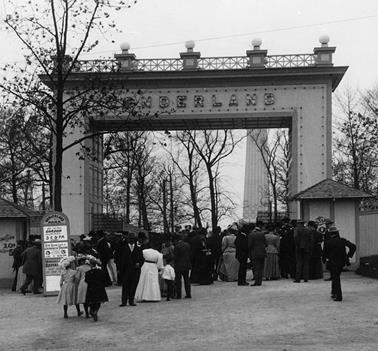 The famed amusement parks had played their role in modernizing the area, however. The desire to collect fees and taxes associated with the park for road improvement prompted the movement to organize Shorewood as a village in 1900. Streets that otherwise may have taken years to build were constructed quickly to carry the crowds bound for the Ferris wheels and roller coasters. The park’s 33 acres were quickly sliced up: a subdivision to the north populated new homes on Newton Avenue and Menlo and Morris Boulevards. The Milwaukee Electric Railway & Light Company (TMERLC) bought the larger southern portion, at Oakland and Edgewood avenues. Which brings us to the next, largely forgotten era: the Oakland Avenue car station. TMERLC operated a number of car stations around the Milwaukee area to store, dispatch and maintain streetcars (and later, diesel buses). A “state-of-the-art” facility was planned for Oakland Avenue, at the end of the city fare zone. Ground was broken on Aug. 28, 1916. The facility was built for the future. It extended almost an entire city block north from Edgewood Avenue. It included a general office and trainmen’s building along Oakland, with an adjoining power substation, and a separate repair shop and car-washing facility. There was a color guard. A quartet of singers performed a song written for the occasion. A power switch was thrown. Oakland Station was as modern as any in the United States, as the Milwaukee system was a progressive industry leader. The sprawling buildings were a stately brick red, befitting their location on Shorewood’s main street. There was a doctor’s office and Christmas parties for employees and their families. A restaurant fed passengers who were waiting for their streetcar. The station could handle every type of streetcar the system had, including snow-fighting equipment. Cars were washed daily. Hundreds of people worked there at its height. Many of them ended up as Shorewood residents. Oakland Station remained all electric rail – its glory years – until the Great Depression. In 1933, the first trackless buses invaded the stately spaces. All over the system, streetcars were being converted to less expensive trackless buses, a conversion completed in the mid-1950s. Cars were still connected to overhead wires, but now had freedom of movement on the street. Passengers could get on and off at the curb, without fear of being run over by autos in the middle of the street. The last streetcar left the station on June 20, 1953, replaced by the trackless trolleys. TMER&LC was sold to the Suburban Transport Company in 1953. Although Milwaukee had one of the largest trackless trolley systems in the United States, half the system was converted to diesel buses in 1962. 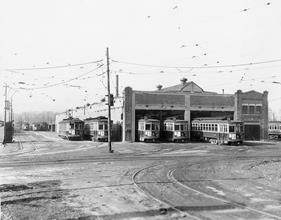 The Oakland Station became the first all-diesel station and its streetcars were consigned to the dust bin of history. On Sept. 1, 1968, the last runs from the Oakland Station were dispatched, lights extinguished and gates locked. In 1970, the building, storage yards and grounds were sold to the village for $1.1 million. Redevelopment began on the quadrant’s north side, where the repair shops had been. Three large retirement apartment buildings were constructed, along with a public park. A study proposed that the trainmen’s building could be converted to businesses or apartment to no avail. The huge trainmen’s building was demolished for additional park land and Shorewood’s last trolley tracks were removed in 1979 to re-pave Oakland Avenue. Despite the fact that for 51 years, this was one of the Milwaukee area’s finest and largest transit facilities, there is no trace of the Oakland Station today – or even of the great amusement parks. Even the Chicago & North Western mainline tracks that once ran behind the property are gone, replaced by the Oak Leaf Trail. As hard as it is to imagine, amusement parks and streetcars in the creation of the village we know as Shorewood today.